TRENDING NOW: Reclaim your time with these time management tips! Have you seen the Powerball lately? Yes, of course you have. It is nice to dream about what you could do if you win, I know I do! However, if you don’t win tonight you can always do a few things to have a little extra cash in your savings or maybe even your Christmas fund that won’t hurt your day to day pocket at all. Here is what I did last year and it worked like a charm! As a matter of fact, I actually looked forward to saving my money just so I could see my little savings account grow! And when Christmas came around I felt like I had my own little stash of cash to use for everyone. Sometimes, it can feel a little weird to use my husband’s money to buy him gifts, but I started this savings plan without telling him at first and since I am the one who handles the bills at home, it felt like I was actually “working for it” since I was the one who kept track and made sure we were able to do it. I also recommend 2 great books to cut down on your spending! Keep reading till the end! 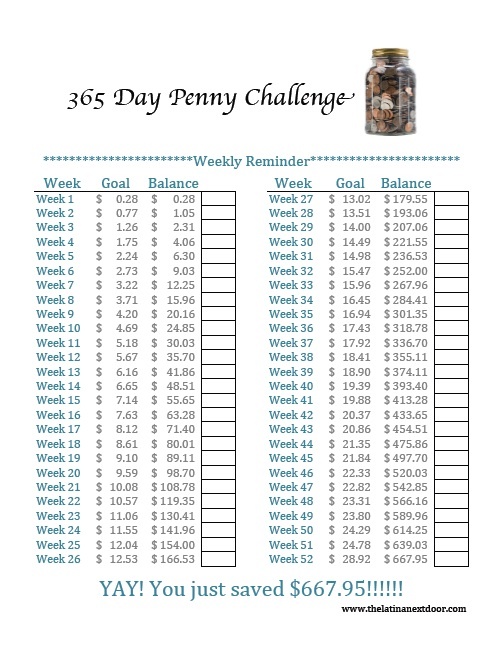 Now if this may be a little bit too much of a constraint each week, especially when you get to the latter weeks, you can always try the 365 Day Penny Challenge. This idea I actually saw on Pinterest, and it works basically the same way, only this one you save $0.01 the first day of the year, $0.02 the second, $0.03 the third and then finally $3.65 the last day of the year. 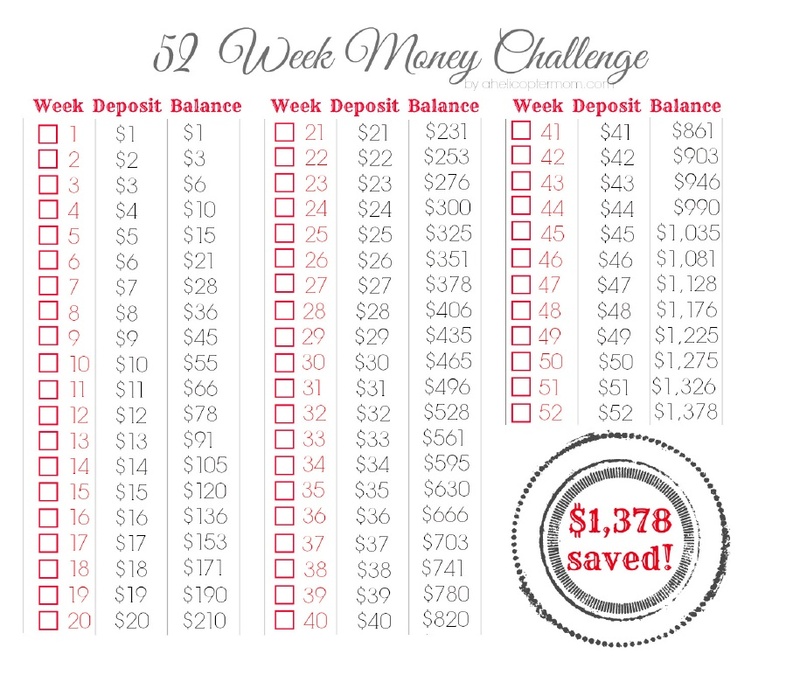 The only problem for me with this is that I don’t work with cash much so I know I won’t have that many pennies lying around so I tried to see if there was a weekly calendar for the Penny Challenge and I found one, but you had to subscribe to a site. There was another but it was in another currency so I decided to make my own little tracker instead. This way when I transferred my weekly amount for the 52 week challenge I could also do the 365 Penny challenge while I am at it. Below is the breakdown showing the balance you save each week! I think this way it is much more easy to do, especially since all you have to do is keep track of doing it once a week! Believe me when I say that with my schedule and my 3 kiddos, I am bound to forget a day here and there. And just think, if you do BOTH, that is an additional $2,045.95 you will have saved by the end of the year! I don’t know about you, but I like that number. Some banks like Bank of America allow you to round up to the nearest dollar on every debit card transaction you make and automatically transfer it to your savings account at the end of each business day. So if you make a purchase for $30.45, the bank will take the additional $0.55 cents and place it in your savings. This little method is usually just a click away and won’t require you to have to keep up with it. Before you know it, you can accumulate hundreds of dollars by the end of the year with no effort at all! The next approach is something my mom taught me since I began making my own money and that is NEVER let zero be zero in your checking account. Always keep your zero at a balance that will keep you afloat if you come into an unexpected expense that month. Let’s say you have $500 that you don’t need to spend, keep it, DON”T SPEND IT and leave it in your checking account to use as your “zero balance” but don’t account for it in your checking account. And when you balance your account (if you still do, I know I do!) instead of having the $687.00 it says you do for example, you actually have $1,187.00. Make sense? Then if you get a flat tire or have to pay for some emergency expense you’re covered and won’t have to dip into your savings that you worked so hard to put away. I would, however, try to build it up again if you do end up using it for an emergency, that way you will be covered for the next unexpected expense. And it doesn’t have to be $500. It could be $100 or $1,000 – WHATEVER you can afford. Some of these things you might have already heard of and others maybe not, but I hope I was able to help someone out there who was thinking of saving some money this year, but thought it was next to impossible. Believe me it is not! It is much easier than you think! And with the charts, hopefully it can make things a little easier for ya! Happy saving and good luck to everyone playing tonight! I have never heard of the checking account balance tip before! That’s a good one. I will definitely try that one out!! 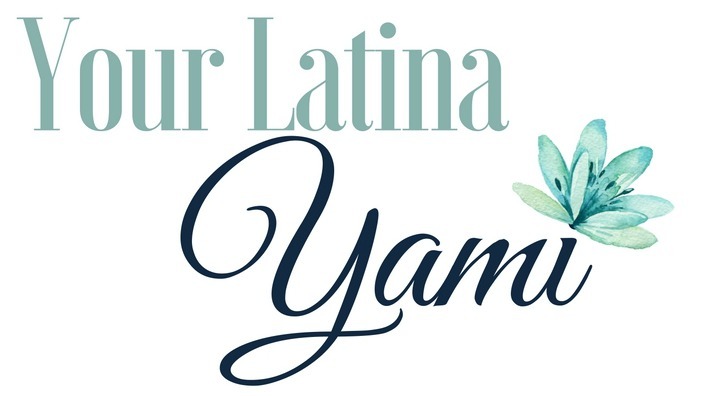 Thank you & best wishes! Thanks for reading! I’m so glad you liked it! Love the money saving challenges! I decided to give it a try with the penny challenge you posted. What a creative and painless way to create a cash fund for something. Thanks for the great ideas! Thank you so much Evelyn for your support! I am glad you liked the idea. 🙂 If I can inspire at least one person to do something new, then it’s all worth it. I did this last year and used it as my vacation fund. I’m Doing it again this year for my vacation. This is an easy savings plan. Yes! I agree! I do this every year for my Christmas fund. It’s definitely super easy! The best part is that you can still do it even though you may not have much extra income to save. The little bits really do add up!